Long-time residents of North Seattle fondly remember the Cloud 9 consignment store on Roosevelt Way NE. Known for great merchandise and passionate volunteers, Cloud 9 was also a philanthropic engine for the Episcopal Church Women group of St. Stephen’s Parish. All the profits from Cloud 9 were granted as seed funds to respond to women’s issues throughout the community. And while the beloved thrift store is gone, the legacy of generosity continues utilizing proceeds from the building’s sale, which were “invested so that we could keep giving back to the community,” says Inez Swanson, a long-time volunteer. Recently, the angels from Cloud 9 granted $100,000 from the fund to install an HVAC system at the Lowry Community Center on Solid Ground’s Sand Point Housing campus.” Air conditioning the Center is a critical step to turn the building into a hub for children and youth on the campus,” says Gordon McHenry Jr., President & CEO of Solid Ground, which owns and operates the 183-unit affordable housing campus. Because of the radiant floor heating and Eastern exposure with floor-to-ceiling windows, the building had been too hot to host summer programs for youth. Thanks to the angels of Cloud 9, Solid Ground and community partners will be able to increase the number and variety of programs available at the Lowry Center, and engage young residents during the critical summer months when school is out. 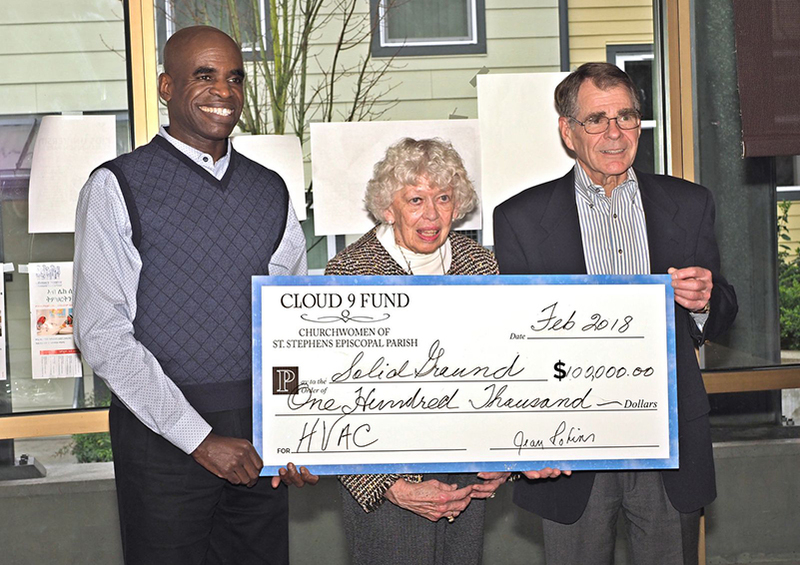 Featured image: (l to r) Solid Ground President & CEO Gordon McHenry, Jr. holds one heavenly check with Inez Swanson & Jack Irby of St. Stephen’s Cloud 9!